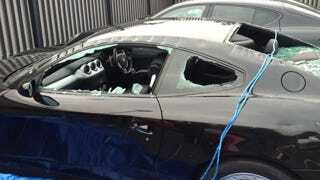 Scottish Authorities are still on the hunt for a man who used an axe to do more than £40,000 ($62,712) of damage to a Ferrari 612 Scaglietti last month. The Italian GT coupe was parked at Graypaul Edinburgh—the official Ferrari dealer of the Scottish capital—when an unidentified man arrived and began attacking the car with an axe and a knife. According to The Daily Record, the Ferrari destruction lasted several minutes before the unidentified vandal slashed the tires of the 612 and then calmly walked away. While the attack was captured by a security camera, the footage has not been enough to clearly indentify the criminal or provide the police with any good leads. Video of the incident has not been released to the public but we imagine watching an axe wielding man destroy the Ferrari would be a rather painful viewing experience for any car person. "This has been a nightmare. The car was just in the garage to get a pump fixed when this happened. I gave the garage a car worth more than £200,000 and they give me back a car that is effectively written off. It is bad enough that this has happened but the garage have been useless. The whole thing is a bad joke." What makes this story even worse is the fact this axe-destruction appears to be a random act. Police questioned Singh about anyone with a possible motive for the Ferrari destruction but as the man explained "the garage is miles from my home" and "no one would have known it was my car." Although the investigation remains ongoing, so far police haven't had much luck. Unfortunately for Singh and other exotic car owners in Edinburgh this means it's looking more and more likely the perpetrator of this axe on supercar violence will remain at large.